@Cat Ba Island | Get Your Grub On! Never give up on your pho. We arrived at Cat Ba Island early morning after a long trip involving three buses and one boat and before heading out looking for some appropriate accommodation we wanted get something nice and filling into our bellies. Since we had just booked a couple of days climbing at Asia Outdoors at the Noble House we just stayed for breakfast at the ‘Good Bar’ downstairs. Not giving up hope to be able to find a great one, I ordered another ‘Pho Bo‘, which again was rather tasteless. 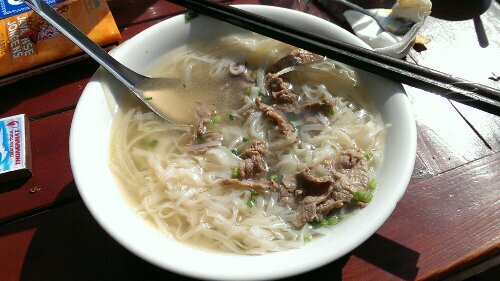 The soup had bland flavours with only a slight hint of cinnamon; noodles were plenty though and the meat was super lean, juicy and with great texture. Overall it wasn’t too bad and for breakfast the light flavours were actually quite fitting. 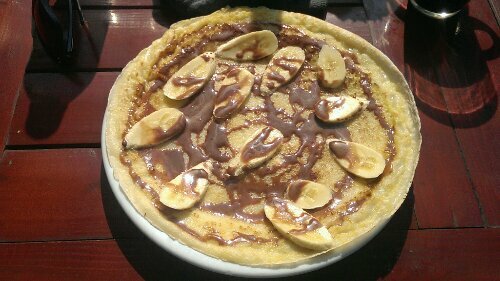 For seconds I had the ‘Banana Chocolate Pancake‘ which was outstandingly awesome. The pancake itself was thin and buttery, topped with the perfect combination of banana and chocolate, which was of the darker kind, so it all wasn’t too sweet either. So good it made me order this nearly everyday during our stay in Cat Ba and will as well if I should ever come back here.